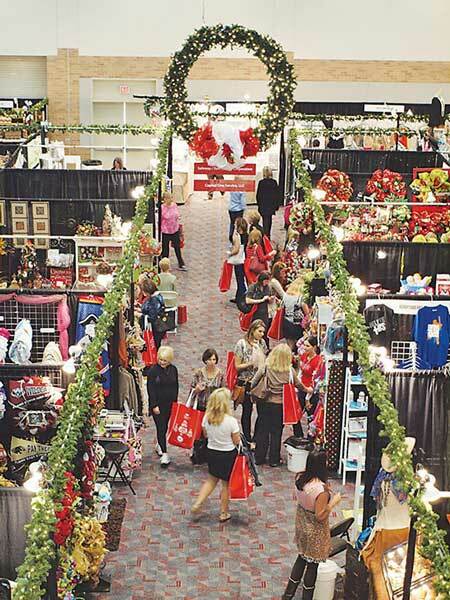 Over twelve thousand shoppers join in holiday gift shopping during the Junior League of Collin County’s annual ‘Neath the Wreath Holiday Market at The Plano Event Center. Kicking of the 22nd year, this five-day holiday market features the best in unique holiday and home décor, ladies clothing and accessories, gifts, jewelry, children’s items and gourmet food from over 100 carefully selected merchants. The week kicks off with the wildly popular Ladies Night Out . Enjoy a night to remember with a buffet dinner, specialty cocktails and live DJ entertainment all while getting early access to the fabulous ‘Neath the Wreath vendors. Also, take your chance at bidding on valuable items from the DFW area hottest shopping, dining, sports and entertainment venues in the silent auction. Complimentary valet provided by RP Valet. Go home with an exclusive VIP swag bag and enjoy additional event perks through the night. For more information or to donate an item to the silent auction or swag bag, contact ladiesnightout@neaththewreath.org. Proceeds from ‘Neath the Wreath and other events held benefit the many Junior League of Collin County charitable projects, volunteer training, community grants and programs impacting Collin County. General market: $12 per ticket in advance at participating Tom Thumb Collin County store locations or $15 online at and at the door. Children 12 and under are free. Ladies Night Out: $50 each available October 10. Questions? marketing@neaththewreath.org or visit the website at www.neaththewreath.org. *For safety reasons, baby strollers, rolling carts, rolling bags, wagons, and pets are not allowed. Over 40 years and 1,000 women strong, connected by values of service, leadership and respect, the JLCC is an organization of women committed to promoting volunteerism, developing the potential of women and improving the community through the effective action and leadership of trained volunteers. Annually, Junior League of Collin County provides community impact through outreach, financial grants and hands-on volunteer support of over 110 local agencies and 12 community projects and initiatives.